A call on African countries to reinvigorate their quest for Universal Health Coverage (UHC) by 2030 rang out from the hills of Kigali, Rwanda's capital, a fortnight ago. 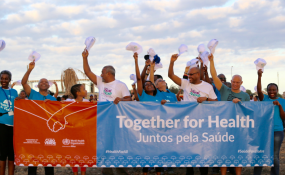 The event was one of the largest biennial health gatherings in the continent – the Africa Health Agenda International Conference 2019 (AHAIC). To advance the critical conversations initiated in Nairobi, Kenya at AHAIC 2017, 1500 participants from over 40 countries gathered at the Kigali Convention Centre (KCC) between March 5 and 7 for this year's conference. Co-hosted by the Ministry of Health of Rwanda and the African Medical and Research Foundation (Amref Health Africa), AHAIC 2019 focused on the greatest health challenges facing Africa under the theme "2030 Now: Multi-sectoral Action to Achieve UHC in Africa". Providing an affordable option for Africa's poorest will determine whether countries achieve SDG 3, which is to "ensure healthy lives and promote well-being for all" by 2030, Githinji Gitahi, CEO Amref Health, explained in his first press briefing. "Financial protections for the vulnerable is embedded in what universal health coverage means by definition, which is a concept that overall looks at how to provide quality health services to people without them struggling to afford it." "Universal health coverage is about equity, not equality," Gitahi said. "Services must first be built for the vulnerable. With that, governments show that the services are responding to equity." Experts at the conference agreed that achieving UHC would require increased access for the marginalised populations and heightened financial support from both governments and public-private partnerships. "It would also require improved health service quality and ways to hold governments and health providers accountable to citizens." One country's success story is another's gain, just as one country's loss is another's lesson. In Rwanda, community-based insurance has provided "the modern social security we want for our people", Rwanda's Minister of State for Primary Health Care, Patrick Ndimubanzi, said. "Today, 75 percent of all residents [in the pilot counties] have been registered and are holding a UHC card," Rashid Abdi Aman, chief administrative secretary at the Kenya Ministry of Health, said. He explained that health programmes requiring registration may need to be adapted for those who lack identification papers. "…All I had built in the scheme now goes down the drain. It hurts", said Dogo Muhammad Waziri, Past Executive Secretary, Nigeria's Health Insurance Scheme (NHIS) in an emotional outburst. The former executive secretary was dismayed by the failure of his country's NHIS to deliver 14 years after inception. "It hurts to see that NHIS has always been in the news for the wrong reasons." "It is as bad as that. In view of this, we want to interrogate why we still have a serious deficit in our journey to UHC." It is the realisation of shortfalls in their health systems that made African governments commit in April 2001 to dedicate at least 15 per cent of their annual budgets to the health sector in what is now known as the 'Abuja Declaration'. "We need to educate our people because from this conference, I can see that many don't know the real situation of our health sector", Lanre Tejuoso, the Chairman, Nigeria's Senate Committee on Health, told PREMIUM TIMES shortly after a panel discussion at the conference. "First of all, I have to educate and lobby my colleagues on the need for health financing. I started with the Senate President…", he said while explaining his role in the inclusion of the Basic Healthcare Provision Fund (BHCPF) into the country's annual budget. Round Up: "Health for All"
Ensuring that everyone has access to basic health services is a challenge and the key to the success of UHC. That was the key take-home that signaled the stirring end of this year's conference. "There is need to ensure that the quality of services is good enough to improve the health of the people who access them," said Michel Sidibé who co-moderated a high-level ministerial panel in a compelling speech. "We need to track the impact of UHC. Coverage is not enough, we need to be delivering quality, affordable, accessible services to all. "The ultimate measure of success for UHC will be whether the poorest, the marginalised and the most vulnerable people are able to benefit." Eleven parliamentarians from Ghana, Kenya, Rwanda, Senegal, Tanzania, and Zambia launched the "Kigali UHC communiqué," committing to strengthening health systems, addressing health inequities, supporting community health and ensuring universal access to immunisation to drive progress on UHC in their countries.